Home » Inspiration » Write With Me Day #30 Write or Die! Write With Me #30 "Write or Die"
The last of Novembers 30 day challenge to write with me daily. 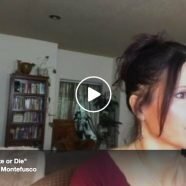 For the month of November 2017 I took on a personal challenge to post a facebook live event on my facebook page. What a fun time! It was terrifying, hilarious, filled with so many surprises. Day #16 – With Guest Sage Cohen about “story fluidity” – coming at familiar stories from new directions, and finding new truths along the way! Day #20 – Do You Suffer From Imposter Syndrome? I hope you enjoy these shows as much as I enjoyed making them. I am still doing my Write With Me Series every Thursday at 9am PST! Just “like” my facebook page and let’s write together! Please share this with a friend that might need a boost to keep writing! !